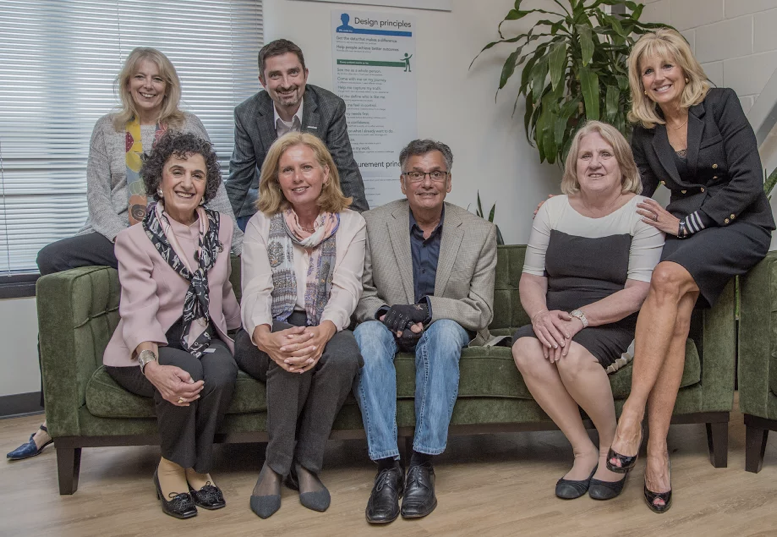 Last month, PatientsLikeMe was honored to host a special visitor — Dr. Jill Biden was in town as part of the Cancer Moonshot Initiative announced by President Obama in his 2016 State of the Union Address. She made time to stop by our office to learn more about how PatientsLikeMe works and how members use the site to manage their health and improve outcomes. During her visit, Dr. Biden was greeted by Co-founder Ben Heywood, who introduced her to some of the folks behind the scenes here at PatientsLikeMe. Ben sat in on a roundtable discussion with Dr. Biden and four patients from our community — Phyllis, Jackie, John, and Laura. 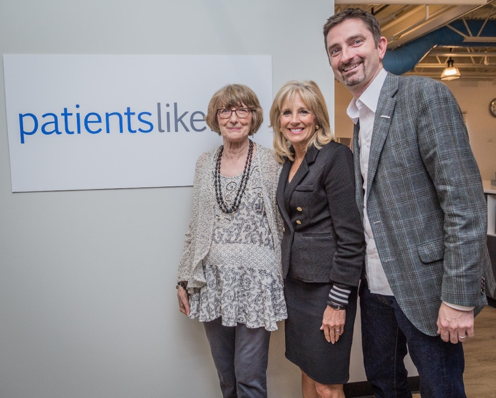 Ben Heywood and his mother, Peggy Heywood (left), pose with Dr. Jill Biden during her visit to PatientsLikeMe. 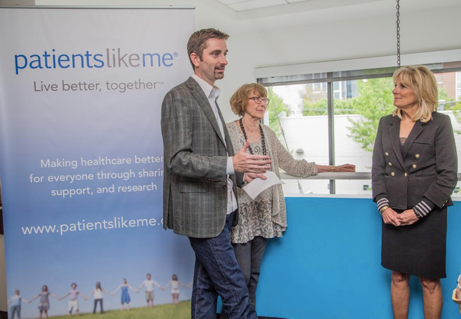 PatientsLikeMe was founded on a simple idea: when patients connect to share their experiences, they can learn from each other how to better manage and treat their disease, and improve their outcomes. We’ve been honing the way we help our members do this for over a decade now, but Dr. Biden’s visit last month was external validation of this simple idea inspired by my brother Stephen’s ALS — and the not-so-simple work that our members and our team are doing now on a much broader scale. It’s important that policymakers understand the challenges of those with chronic illnesses and what it’s like for them to live within today’s medical system. I think what resonated most with Dr. Biden was hearing our members’ stories. We invest so much money in healthcare and have made incredible strides in technology and advancing treatments. Yet traditional clinical care only accounts for a certain percentage of outcomes. It doesn’t encompass the rest of a patient’s life and environment — access to good nutrition, financial stress, daily life — which are likely to have as significant an impact on one’s illness. It’s important to understand the full narrative of the patient experience in order to begin to think about that problem more holistically. As Dr. Biden looks at big data and other things, I hope it will bring new focus to the importance of understanding this narrative and putting it into a data framework. From a policy standpoint, there are clearly things that need to be advanced. The Affordable Care Act took away pre-existing conditions for health insurance. That needs to be considered in other areas like life insurance, long-term care, and other areas. I believe we should be talking more about laws around preventing data discrimination and protecting personal medical information, much like in GINA (the Genetic Information Nondiscrimination Act). I hope Dr. Biden will continue to advocate and fight for patient-centricity. This means investing in and doing all the work necessary to meet patients where they are, give them access to meaningful data, and allow the most active and engaged patients to show what’s possible with their own information. Dr. Biden’s visit was also significant on a personal level. I lost my brother, Stephen, and Dr. Biden and my mother lost a son. That’s a strong shared connection. What I think Stephen did for our family was give us the moral authority to amplify the voice of patients. While it’s amazing what medicine can do today, we can still do better. I believe the Bidens experienced something similar to the calling we felt — the realization that that fundamentally, the healthcare system should be about patients, for patients, and designed to help patients get the most benefit. And the starting point is effectively measuring what patients value most in their care. I’m very proud of our team and how we’ve worked together with our patient community to demonstrate what’s possible in healthcare. For me personally, it’s really powerful and exciting to have the spotlight shown on that and to really highlight this part of our work. You helped us reach our goal for #24DaysofGiving! That’s right, you did it again! A big thank you to the PatientsLikeMe community for helping us reach our #24DaysofGiving goal for the second year in a row. Together, you donated 476,243 health data points! We’ll be making a $20,000 donation to Make-A-Wish® Massachusetts and Rhode Island to help fund life-affirming wishes for seriously ill children. To show our appreciation for all that you’ve done, we wanted to do something special in return. We made a video featuring some PatientsLikeMe staff talking about why your data donation matters. You’ll hear from co-founders Ben and Jamie Heywood, CEO Martin Coulter and team members from all parts of PatientsLikeMe. From all of us at PatientsLikeMe, thank you for re-thinking what it means to give this holiday season. Data for you. For others. For good.